Iyaric, Livalect, Dread-talk or I-talk is a consciously created dialect of English in use among members of the Rastafari movement. African languages were lost among Africans when they were taken into captivity as part of the slave trade, and adherents of Rastafari teachings believe that English is an imposed colonial language. Their remedy for this situation has been the creation of a modified vocabulary and dialect, reflecting a desire to take language forward and to confront what they see as the confusion of a corrupt and decadent society they call Babylon. This is accomplished by avoiding words and syllables seen as negative, such as "back", and changing them to positive ones. Some if not most Rastas choose not to use certain words in the English language as they have Babylonian and devil-like connotations. For example, the word "hello" is not used because it contains the word "hell" and "lo" referring to "low". Instead words such as 'Wa Gwaan', 'Yes I' 'Cool Nuh Iyah' are used because they are words that uplift people. If at a Rastafari church, they would use their formal church greetings. For instance, the Rastafari branch known as the Twelve Tribes of Israel would say, "Greetings in that Most Precious and Divine Name of Our Lord and Saviour Jesus Christ, who has revealed Himself through the wonderful personality of H.I.M. Emperor Haile Selassie the 1st of Ethiopia"
Iyaric is sometimes also referred to as Wordsound — a name derived from the Rastafari principle of "Word, Sound and Power", which several scholars have compared to West African concepts regarding a power or essence being encapsulated within the pronounced sound of a name or word. Iyaric sometimes also plays a liturgical role among Rastafari, in addition to Amharic and Ge'ez. I and I (also spelled I&I, InI, or Ihi yahnh Ihi) is a complex term, referring to the oneness of Jah (God) and every human. In the words of Rastafari scholar E. E. Cashmore: "I and I is an expression to totalize the concept of oneness. 'I and I' as being the oneness of two persons. So God is within all of us and we're one people in fact. I and I means that God is within all men. The bond of Ras Tafari is the bond of God, of man." The term is often used in place of "you and I" or "we" among Rastafari, implying that both persons are united under the love of Jah. Also in the Twi language (in which patois uses a lot of Twi loan words) of Ghana, Me ne me is also said, which literally translate to "I and I". I-tal or Di food fula itality is spiritually blessed food that has not touched modern chemicals and is served without preservatives, condiments or salts. Alcohol, coffee, milk, and flavoured beverages are generally viewed as not I-tal. Most Rastas follow the I-tal proscriptions generally, and many are vegetarians or vegans. Even meat-eating Rastas abstain from eating pork, as pigs are scavengers of the dead, as are crabs, lobsters, and shrimp (whose banning coincides with the restrictions of Kashrut). I man is the inner person within each Rastafari believer. Irie refers to positive emotions or feelings, or anything that is good. Specifically it refers to high emotions and peaceful vibrations. This is a phonetical representation of "all right". Ites derived from English "heights", means "joy" and also the colour "red". It can also be short for "Israelites". Irator replaces "creator", and Iration replaces "creation". Idren or Bredren and Sistren refer to the oneness of Rastafari and are used to describe one's peers (male - "bredren", female - "sistren"). Itinually replaces continually. It has the everlasting/everliving sense of I existing continuously. Inity replaces "unity", demonstrating a general pattern of replacing "you" and similar sounds with "I". Iya (higher): Rastafari vocabulary is full of references to the "iya man", "stepping higher and higher", etc. It is not a reference to the "high" normally associated with cannabis, but to stepping into higher realms of reality, as in higher awareness. Iya is also used to refer to a friend. As in "Yes Iya", or "Cool (no) Iya". Iyaric is the self-applied term for Rastafari language. It is formed by a combination of Iya (higher) and Amharic, the language spoken by Haile Selassie I.
Iwa replaces "time" or more accurately, "hour": "Inna this ya iwa." Dreadlocks describes the locks commonly worn among Rastas, now universally called dreadlocks in English. The 'dread' component refers to the fear of the Lord, as well as the fear inspired when Rastas first began to grow locks in the 1940s in Jamaica. To Rastas, dreadlocks can be a deeply spiritual part of their identity. The Nazirite vow in the Torah and the story of Samson are commonly cited: "And she made a vow, saying, 'O LORD Almighty, if you will only look upon your servant's misery and remember me, and not forget your servant but give her a son, then I will give him to the LORD for all the days of his life, and no razor will ever be used on his head'." 1 Sam 1:11. [permanent dead link] Rastas see this as the most natural way to grow one's hair, as well as a symbol of defiance of Rome and Babylon. Dreads can refer to the dreadlocks, or to those who wear them. Persons without dreads are sometimes called baldheads (somewhat derisive) or lack (more respectful); however as a common Rasta refrain points out, "It's not the dread upon your head, but the love in your heart that makes you Rasta..." meaning that many Rasta faithful themselves lack dreadlocks, while some non-Rastas, wolves inna sheeps clothes, may wear dreads solely for fashion. Dreads that were induced artificially or with additives, rather than allowed to take their natural course, are known as bathroom locks. Babylon is an important Rastafari term, referring to human government and institutions that are seen as in rebellion against the rule of Jah (God), beginning with the Tower of Babel. It is further used by some to mean specifically the 'politricksters' who have been oppressing the black race for centuries through economic and physical slavery. In a more general sense, Babylon refers to any system that oppresses or discriminates against all peoples. 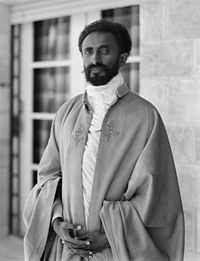 Rastafari is defiance of Babylon, sometimes also called Rome — in part because of the 1935 Italian invasion of Ethiopia, then ruled by Rastafari's 'Living God,' Haile Selassie I, and partly because as the head of the Roman Catholic church (the Pope) is considered an opponent of Selassie I and Rastafari. Babylon the Great and Whore of Babylon are apocalyptic terms from the book of Revelation that may have been used to describe the pagan Roman Empire, which often persecuted Christianity. Babylon is also sometimes used by some Rastas with the more specific meaning of "police", insofar as they are seen as executive agents of Babylon's will. Politricks is a Rasta term replacing English "politics", because so many politicians, etc. turn out, they say, to be more like tricksters. Politrickster n.
Everliving replaces "everlasting", particularly in the context of Life Everliving. The "last" in "everlasting", although actually implying survival (to "last" is to "survive" or "bide through"), is seen by the Rastas as implicative of an end (as in the term "at last"), and as the life the Rastas have will never end according to them, they being immortalists. Often used in the phrase "...I and I is Everliving, Everfaithful, Eversure. Ras Tafari." H.I.M. (His Imperial Majesty), pronounced him, and referring to Haile Selassie I.
Downpression replaces "oppression", because oppression holds man down instead of keeping him up (pronounced op in Jamaican patois.) Similarly "downgression" = "violence" (from aggression). Downpressor n.
Livication replaces "dedication", to rid itself of a connotation of death. adj. Livicated. v. Livicate. Outvention replaces "invention", because mechanical devices are seen as outward; it is the inner experience of being Rastafari that is invention. Overstanding (also "innerstanding") replaces "understanding", referring to enlightenment that raises one's consciousness. Apprecilove replaces "appreciate" because of the similarity to hate. Amagideon/Gideon is a Rasta theological concept meaning the general state the entire world is in now, and has been getting progressively deeper in since 1930, and especially since 1974. This is a slight mutation of Armageddon, a name appearing in Revelation. Zion refers to either Ethiopia or the whole continent of Africa, after the Day of Judgment, as well as a state of mind one can enter through Rastafari. Know replaces "believe". Rastafari would not say they "believe" Haile Selassie is Jah and that they, the Rastas, are the chosen people. They would say they "know" these things. Whore of Babylon is the Revelation character sometimes considered to be Queen Elizabeth II, who is still the Head of State of Jamaica; or the papacy; or both. Several Rastafari words have migrated into mainstream English usage, or even widespread global usage. The term dreadlocks, for example, is used worldwide for the hairstyle that was popularized by the Rastafari. Rastafari usage of words like Zion and Babylon also the term "overstand" and "politricks" have entered hip hop culture through Caribbean-American and Caribbean-British rappers/musicians. In Europe, perhaps influenced by popular culture depictions of or actual encounters with Afro-Caribbean "rude boy" gangs, the term Babylon is sometimes used to refer to the police. ^ Barnett, Michael (2018). The Rastafari movement : a North American and Caribbean perspective. Abingdon, Oxon. ISBN 9781138682146. OCLC 985268340. Johnson, Ken (1972). "The vocabulary of race". In: Rappin' and Stylin' Out: Communication in Urban Black America. Thomas Kochman, ed. Chicago: University of Illinois Press, pp. 140–151. Levine, Robert M. (1980). Race and Ethnic Relations in Latin America and the Caribbean: An Historical Dictionary and Bibliography. Metuchen, New Jersey: Scarecrow Press. Mills, Jane (1989). Womanwords: A Dictionary of Words about Women. New York: Free Press. Pollard, Velma (1982). "The Social History of Dread Talk". Caribbean Quarterly. 28 (4): 17–40. JSTOR 40653574.